It is often said that breakfast is the most important meal of the day. But why should mornings get all the glory? 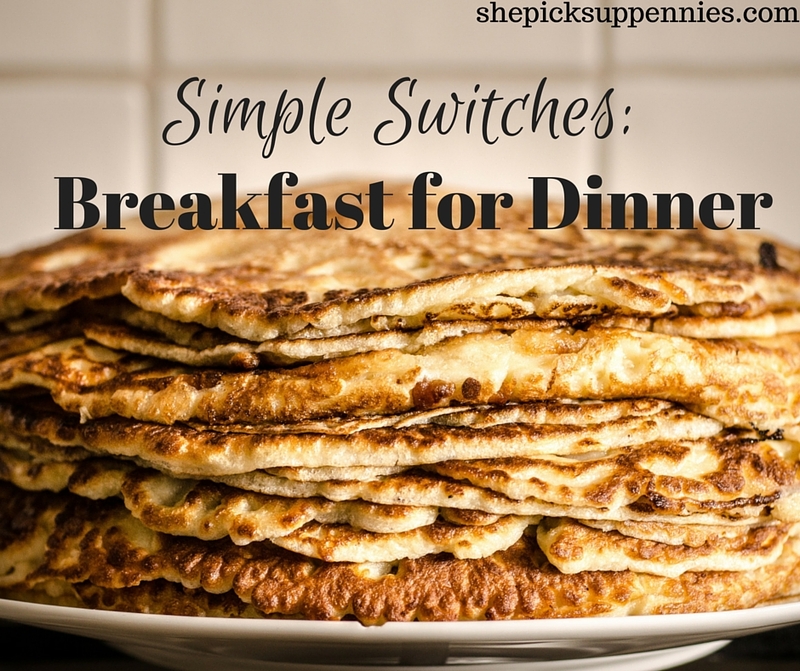 For a fun change of pace and for some serious savings, try serving breakfast for dinner once a month or more. There’s something wonderful about making pancakes from scratch or whipping up omelets full of your favorite fixings. Unfortunately, though, many people don’t have that kind of time most days, so they adopt other morning meal plans. For instance, my $0.23 oatmeal breakfast routine is healthful, efficient, and frugal. While I can’t foresee ever giving up this routine, I do get nostalgic for the Mickey Mouse pancakes* of yore every once in a while. When that happens, breakfast for dinner to the rescue. I can still enjoy my favorite breakfast treats without adding to my morning rush. I’ve also found that most breakfast meals cook up fast by dinnertime standards. While there are certainly plenty of economical dinnertime dining options, breakfast foods can be real cost savers, especially if you’ve set an ambitious goal of a $200 grocery budget for the month. Once you buy the few ingredients necessary for scratch pancakes, you’re set for a few meals. Or you could stick with my beloved oatmeal but create a toppings bar using fresh fruits and other ingredients that you already have around the house. The same goes for omelets. Leftover veggies? Add them. Only a few pinches of cheese left? Toss it in. Eating ham for lunch? Include a few scraps. The ingredients don’t have to be fancy. With most breakfast meals, the preparation is just as fulfilling as the meal itself. There’s something so wonderfully childlike about tossing in a few blueberries before the batter starts to sizzle away on the stove. So Tell Me…Are you a fan of breakfast for dinner? Can we make “brinner” a thing? Breakfast is sooooo cheap! It’s usually just a variety of carbs, eggs, and cheap fruits like grapes, cantaloupe, and oranges. A much welcomed break from expensive (relative) dinner foods! It is a nice break, isn’t it? I feel like it’s less planning, too. A sigh of relief across the board for a low-stress meal. We host a group for dinner every week, and normally I try to do “real” food like tacos or soup or burgers, but I would say at least once a month we do breakfast for dinner because I’ve failed to shop in advance. Its so easy, and we always have eggs, pancake ingredients, and fresh fruit. What a fun event! Sounds like a tasty and enjoyable time. We usually stick to oatmeal for breakfast, but make breakfast for lunch at least once a week. I’m a big fan of it for dinner, but my husband struggles with not having veggies with dinner and it’s gross to serve veggies with your Mickey pancakes! You’re right – veggies and pancakes don’t mix. Unless pumpkin pancakes count! I love me some brinner! I’m a big fan of breakfast but my wife’s not much of a morning person, so breakfast for dinner is the perfect compromise. It’s great for saving money or as a back-up meal plan for nights when you don’t want to do a lot of cooking. It’s simple and fun, right? I usually cook solo, but my husband loves to jump in if it’s breakfast. I agree with you that breakfast is usually very cheap unlike other meals and, i usually take breakfast for dinner sometimes and i love it.